I recently knocked a fin out of my modern short board and was forced to plunder the collection for somthing to ride in the recent good swell we have had. I pulled this 5'10 Grant Miller shaped Hot Dot out of the store room. I normally ride a 6'3" so this is a very small board for me. I took it out at a well known Sydney reef break and it went amazingingly well! So I did a bit of reasearch on the shaper. Grant Miller is a surfer/shaper who was part of T2 period NORTH NARRABEEN CREW. (T2, Transition2 being 70s>80s 1fin>3fins, T1 being 60s>70s longboard>shortboard. In the very early 1970's T1 was largely possible through the efforts of McCoy & SHANE..from whom the latter decade T2 TRIAD was born..Col Smith from McCoy, Terry Fitz & Simon Anderson from SHANE)..
Grant was right there on the scene during the development of the first 3 fin thrusters, and his early designs have proven the test of time. 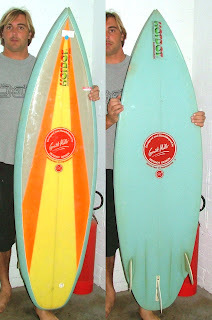 What is interesting about this board, as well as its flouro spray job, are its fins. They are nearly identical in size, shape and foil to the new Australian Design Award winning H-2 FCS fins. It seems Grant was 25 years ahead of his time. what would this board be worth.